Since getting back from new York, I’ve been having major ramen cravings. There are a number of ramen restaurants that have opened up in london in the last year and I needed a reason to make a visit. When a dinner that had been organised some time ago finally came around, I made a snap decision to find a ramen restaurant that was veggie friendly. We arrived at Shoryu on lower regent street at 6.30 on a Wednesday evening. Although it is one of these new style “no booking” restaurants, we were seated pretty much right away. Upon recieving the menu, we realised Happy Hour was due to be finishing in 30 mins, so we quickly chose our 4 cocktails each (yes I did just say 4) and then signalled for the waiter to take our order. To soak up what was going to be a fair amount of alcohol & satisfy the hunger in our bellies, we also ordered some Hirata buns & the very yummy sounding Schichimi Mushrooms. Two cocktails arrived with a side of Hirata Buns. 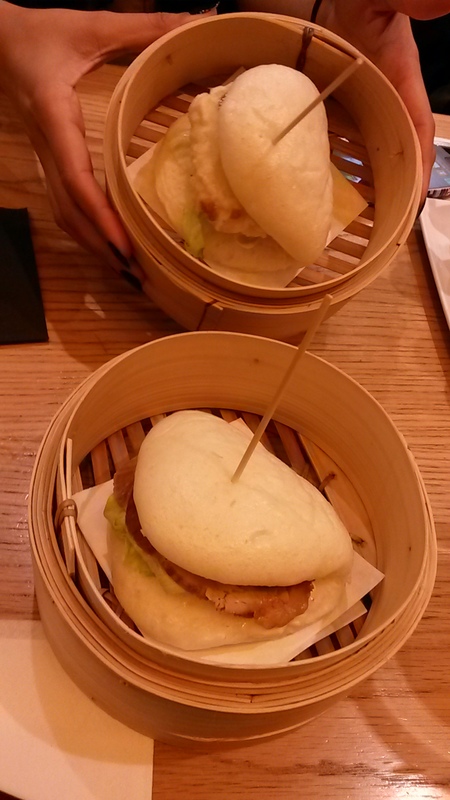 When I asked the waiter which of the non vegetarian hirata bun’s I should choose, he highly recommended the belly pork. So obviously I obliged. Miss Veggie went for the veg option of halloumi & shimeji mushrooms. My first issue was the fact that the actual bun was not hot, my second was the fact that they had used mayonnaise which basically made this taste like a nicer version of a McDonalds Hamburger. Next up was the Shichimi Mushrooms, essentially pan fried asian mushrooms with tofu & 7 spice. I have to say, these were rather delicious. 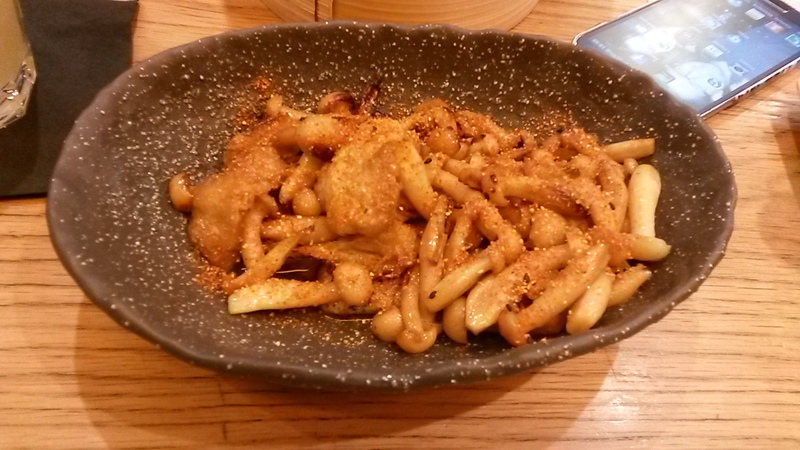 The mushrooms were perfectly cooked and silky, the tofy was crispy and the shichimi spice added a kick of spice. Perfectly well rounded dish in my humble opinion. 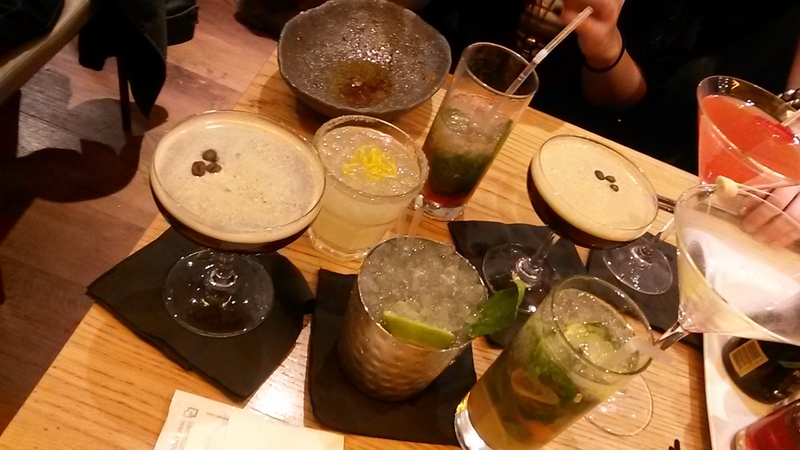 Having finished our two starters, we were left to happily chat away and consume copious amounts of alcohol. Shoryu has a pretty decent Cocktail Menu and of the 8 drinks that we ordered I would highly recomment the Yuzu Mojito, the Rising Sun Berry Martini & the extremely delicious Espresso Martini (half of which ended up on Miss M’s trousers thanks to the guy on the next table). 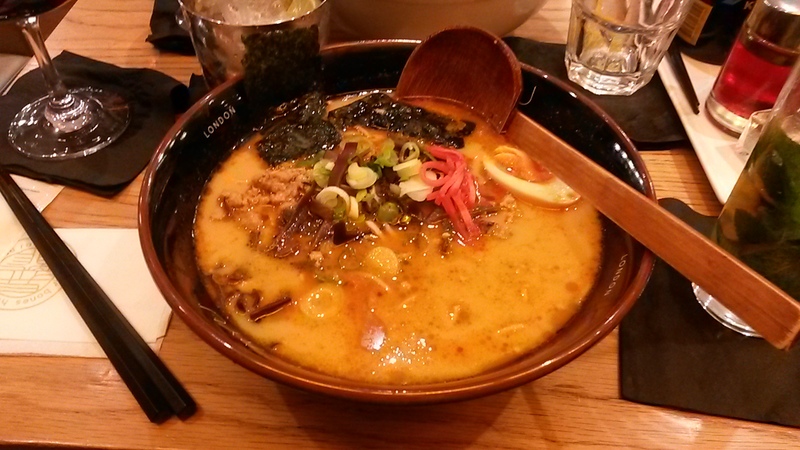 Having mopped up the Espresso Martini, we decided our appetites had returned, so we went on to order the ramen. Given that there was only one veg option on the menu, Miss M’s choice was pretty much made for her. I however had a much more difficult job deciding what to indulge in. I finally decided on the Karaka Tantan Tonkotsu. Described as rich and spicy fried minced pork in white miso & garlic with added lemon, garlic and chiu chow chilli oil on the menu, I was completely satisfied when it arrived. The Minced meat made the dish slightly heavier than it needed to be, but the broth was delicious albeit slightly spicy. The meat was perfectly seasoned and the hint of garlic added a lovely addition. Whilst I was unable to get through all of the noodles, I happily slurped my way through the broth. Miss M was equally satisfied by her Natural ramen – a shiitake & konbu gluten free soy broth, tofu, kikurage, seasoned beansprouts, spring onion, sesame and spinach. Having made out way through started & mains, it was time for a little dessert to end the meal. Miss M went for the Matcha Cheesecake, which I obviously had to sample for the sake of my reading audience (I did it for the people!). The texture which was slightly jelly like was silky and perfectly set. The matcha flavour was delicate and not at all overpowering. I definitely could not fault it in any way. For those who are unaware, I have a slightly obsession with Matcha Ice cream, whenever I see it on a menu, I must order it, so obviously I did just that. However to widen the barriers slightly, I ordered it with a side of sesame ice cream. 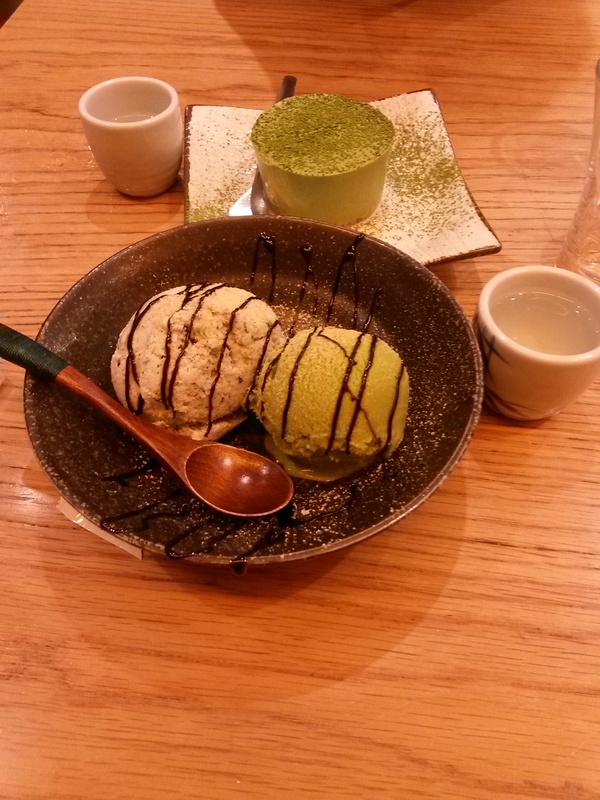 Both ice creams were great, Miss M commented that the flavour in the Matcha Ice Cream was actually stronger than the flavour in the Matcha Cheesecake and I have to admit, she wasn’t wrong. The sesame ice cream was interesting, with a very slight sesame flavour, but enough to be noticeable. On the whole we were both perfectly satisfied. When we arrived at Shoryu, it was clear to see the place was popular and by the number of bowls on tables, it is clear that the place is popular for one thing – the Ramen. For those planning to visit, try a few of the starters but leave space for the ramen. If you only have space for one thing, the Ramen should be your choice and you will not be disappointed.